Local authorities increasingly need to demonstrate the legitimacy of their decisions and to develop effective and appropriate forms of citizen engagement. Previous literature has highlighted many advantages of citizen engagement, but has also acknowledged that authentic public participation is rarely found. 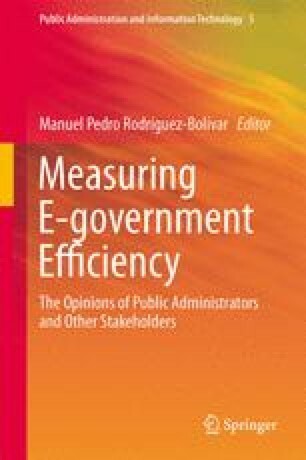 This chapter uses different sets of empirical data reflecting the opinions of different stakeholders about e-participation initiatives. We aim to analyze whether citizens are familiar with e-participation tools, what citizens and organizers think about the effectiveness of citizen participation, and, finally, whether there is a perceived effectiveness gap between online and offline (traditional) forms of participation. Results show that, despite a high rate of Internet use, the level of use of e-participation among citizens is quite low. Nevertheless, the opinions of citizens and public sector managers regarding e-participation tend to be positive. As regards perceived effectiveness, some differences exist between citizens’ and managers’ perceptions. Citizens feel that e-participation is less costly and at least as good as offline participation, but it seems that greater changes are achieved through offline participation. Managers tend to agree that online participation is better in reaching a higher number of potential participants, and also in its immediateness and in the lower effort required, whereas offline participation is thought to be better at building social capital. This study has been carried out with the financial support of the Spanish National R&D Plan through research project ECO2010-17463 (ECON-FEDER) and of the European Science Foundation/European Collaborative Research Projects through the project EUI2008-03788.